THE DEVONSHIRE FELL HOTEL, BURNSALL, NORTH YORKSHIRE. My wedding season really couldn’t have started off any better and that’s all down to Sophie + David, their adorable little man Harry, both sets of parents Richard + Gill, Tony + Lynne, bridesmaids Robyn + Amy. The suits…Nige, Chris, Sam and the super cute team of page boys and flower girls. The rest of this crew, well…a perfect mix of Lancashire and Yorkshire, two counties close to my heart. Daisy, the couples Dachshund needs a special shout out too, there are way too many photos of her in the collection but she’s just ace! She sat on Sophie’s knee throughout Bridal prep and followed her every move, looking her up and down when she started putting her dress on, almost like she was giving her the nod of approval! I left when Sophie was all ready and headed for The Devonshire Fell Hotel. David was up there with his Best Man and Ushers, greeting friends and family as they arrived and took to their seats. The ceremony room looked beautiful dressed with Ranunculus, pink Roses and Gypsophila. The ceremony itself was beautiful too and soooo emotional! Not a dry eye in the room and just to get the tears really flowing, Sophie’s brother, Sam, delivered an excellent reading. As the new Mr + Mrs Hurley made their way down the aisle, Mark Waddington- Magician was waiting in the wings to entertain guests. He is fab and they LOVED him! The couple chose to serve their three tiered cheese cake during the time after the ceremony, a great idea as they’d opted to have the speeches before the meal and it was gone in minutes. No wedding at The Devonshire Fell Hotel is complete without heading down to the bridge. We can all pinch ourselves and feel mighty lucky with the weather we were dealt that day. The days leading up to their wedding had been pretty wild, so to be able to head down to the village and get all their outdoor shots in the bag before dinner was a great feeling! A time for David + Sophie to step away from it all for a moment and get some ‘couple time’. 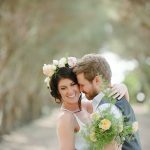 Their couple shots are amazing! For my first wedding of the season and I’m chuffed to bits. These two ROCKED it! They were a dream to work with. Clearly made for each other. A couple so warm, bursting with kindness and so in love that it hit me on impact the second I met them. Now to the speeches…it’s a hard task to follow a great Father of the Bride speech but David and Nige (bestman) did just that. Sophie’s Dad dedicated an actual song to her…swoon! David’s had us all in tears…again, and Nige’s had us all in stitches. Well done boys! 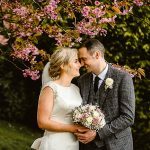 Mr + Mrs Hurley…you’ve made me a very happy snapper indeed! You’ve made me sob my heart out, made my belly hurt from laughing so much, made me feel such a part of your special day and made me feel like I must be in the right job. Thank you so much for getting me on board. I’ll never forget you or your amazing day and I wish you all the love and happiness in the world. Here are your highlights. THANK YOU!! The Devonshire Fell Hotel in Burnsall for pure Yorkshire hospitality at its best. Amelia’s Bridal for the stunning wedding dress. Emily Taylor at La Bella Boutique for the fabulous up do’s. Sam Williams wedding flowers for the floral loveliness. Yorkshire Cake Fairy for the jaw-dropping goodness. The Courtyard Dairy in Settle for THAT CHEESE. Mark Waddington – Magician for wizardry shenanigans. Irregular Choice for the bride’s sparkly feet.